I’ve been looking forward to this one all year, hoping for some lighthearted fun. I wasn’t disappointed. I’d imagined Leela and Tegan running circles around poor Five, who can barely manage to handle one of them. And how could Peter and Lou, old hands at comedy, and Janet, master of snark, not deliver an entertaining farce? Sure enough, this audio achieves almost Pirate Planet levels of humour. So. The Time Lords have finally caught up with their disappearing-act president, after Chancellor Flavia made rather a mess of things post-Five-Doctors. A new Chancellor has decided to bring the Doctor aboard as a popular figurehead, while the “No, not the Mind Probe” Castellan’s successor is more skeptical about the Doctor’s qualifications. Tegan, who accompanied the Doctor for a quick side trip at the end of Frontios, gets dragged along for the ride. Leela does her best to assist while occasionally threatening bodily harm to various and sundry, including Tegan. 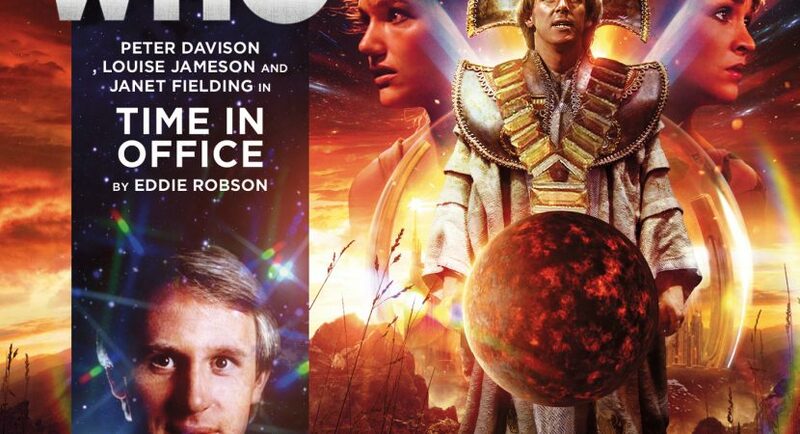 The four half-hour episodes of Time in Office are largely self-contained, each with a different crisis or two to keep the Doctor, friends and councillors scrambling. Tegan, who’s always been resourceful despite her grousing, proves to be as skilled as Leela in adapting to the realities of Gallifrey. (Thank goodness it’s Big Finish and not classic Who TV, which would’ve parked Tegan in an air duct.) There’s a lively, easygoing dynamic between the three regulars, who are clearly having a lot of fun with this script. Not that the audio doesn’t include serious crises and moments of danger. Banter is underpinned by sly commentary about stodgy Establishment vs. rebels (who aren’t necessarily an improvement), and how power goes to people’s heads (even Tegan isn’t immune). But for the most part, this is lighter fare than usual for Tegan and the Fifth Doctor, whose friend Nyssa is something of an angst magnet. Thanks, Eddie Robson. Even if I did draw some strange looks while walking down the sidewalk smiling and chuckling. Listen for the floomph-floomph-floomph noises of the Doctor stumbling around in his robes in episode 4. Also, I missed it on the first listen, but while Scandrius was berating the Doctor for losing his rebellious streak, another student was flooding in the Academy with the Doctor’s covert blessing. Not to mention the fact that the Doctor had just stolen an instructor’s TARDIS for a joy ride and trashed it. Peter succeeds in making the twinkle in the Doctor’s eye audible.